Will the nail look ugly after surgical treatment? Right toenail after ingrown toenail surgery both sidesAfter the nail is fully healed it will be slightly narrower than before (which is the whole point of the procedure). In most cases it is hardly noticeable. Other than that, there are usually no other aesthetic problems. Is laser surgery more effective in ensuring that the ingrown toenail won't come back? Laser is just one method of several that can be used during nail surgery. If the procedure is done properly then the ingrown toenail will almost always not return, regardless of which procedure was used: laser, acid, or even more invasive methods. Even if laser treatment is applied, if not done properly then the ingrown toenail can still come back. Hillel uses the acid during his surgical procedure to destroy the problematic small section of the nail root to ensure that the ingrown toenail does not recur. Hillel's record (without the use of laser) is nearly 100% successful! This depends on the patient. Everyone has different pain thresholds. In most cases there is some degree of sensitivity for a day or two after the procedure. The pain should subside fully within a few days if the toe is dressed and cared for, as per the instructions given by Hillel Gluch. When will I be able to walk /work after the procedure? Usually you can walk and work regularly immediately after the surgical procedure. There may be some sensitivity on the first day or two, however, it is usually not severe enough to prevent you from working. If my toe is infected, must I get rid of the infection before I can go to the podiatrist? No. This is a common misconception. The toe is infected because of the ingrown toenail. In order to help it heal, the section of nail that is ingrown has to be removed. After the procedure, the patient will be given instructions on how to dress the infected area. The podiatrist will inform the patient if oral antibiotic treatment is needed in addition to the dressings. For permanent relief via the surgical procedure, it is preferable for the toe to be as infection free as possible. Can the ingrown toenail come back after the procedure? Hillel's record is close to 100% with very few regrowths. But there are occasional regrowths, in which case Hillel will do a repeat treatment according to the need at no extra cost. How do I ensure that it doesn't come back again? When cutting the nail, let the nail grow slightly longer, cut straight across and not too short. Do not wear narrow shoes, high heels or other constrictive footwear. Wear appropriate footwear for sports activities. Patients usually fear the treatment for ingrown toenails and think that it will hurt severely. This is NOT the case for most people. The fear is often greater than the pain. Hillel Gluch has been known to do the procedure as painless as possible. Many patients comment after the treatment that they were pleasantly surprised how quick and painless it was. There are various degrees of ingrown toenails. In most mild cases the conservative treatment is quick and is done without the need for local anesthetic. In severe, chronic cases the treatment may need to be done with the aid of a local anesthetic. The anesthetic is administered in the toe (but not at the site of the ingrown toenail), numbing the toe completely. This is usually the most painful part of the treatment. Then the treatment is done without the patient feeling anything. In many cases, however, the treatment can be done without the need for a local anesthetic. In the permanent procedure, local anesthetic is always used. The patient feels no pain at all after the anesthetic has been given. 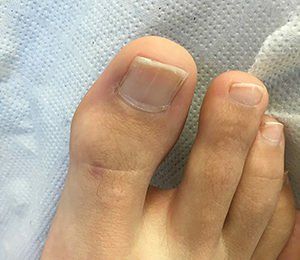 When you come to the Hillel Gluch Ingrown Toenail Center for your treatment, Hillel Gluch will examine your toe and discuss with you the treatment options according to your specific situation. For how long after the procedure do I have to dress the wound? The toe should be cleaned and dressed according to the instructions given by Hillel Gluch for the first two to four weeks, depending on the healing rate of the patient. I have a recurring ingrown toenail. Do I have to have the surgical procedure or can it be avoided? You always have the option of not doing the surgical procedure. Hillel is well known for his ability to remove the ingrown toenail section relatively painlessly without the need for the surgery. However, in chronic cases the problem will usually continue to recur every few months, and the surgical procedure is the only way to ensure permanent relief. Refresh site if map does not load.